This would make a very nice personalized gift for Valentine's Day or Mother's Day . 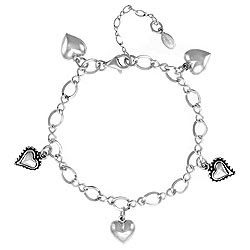 . .
Made is Canarias is giving away a sterling silver charm bracelet with up to 8 charms of the winner's choice. There are several ways to earn extra entries. This contest is open to Worldwide entries and ends on January 21st, 2010.